I've been back home in LA for a week and have been back in healthy donabe cooking! Soba honey…another unique gift from Japan. It’s a rare raw honey from 100% soba (buckwheat) flowers, from a small farm in Yamagata. I tasted a little spoonful of it to try, and wow, the flavor is so unique and powerful. It’s like a combination of raw honey comb and dark molasses extract. I thought this honey would be great with earthy gobo (burdock root). 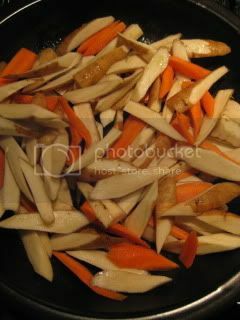 So, I made steam-fried gobo & carrot, and flavored the dish simply with my shio-koji and this soba honey. 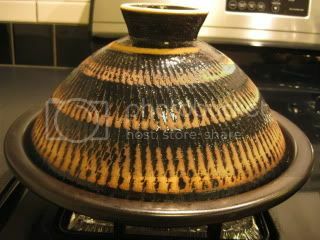 For this dish, I used tagine-style donabe, “Fukkura-san”. Nothing can do the better steam-fry job than this cute donabe. For the best “steam” effect, the lid was first soaked in water for 5 minutes and drained. (Porous Iga clay absorbs moisture and releases the steam during cooking.) 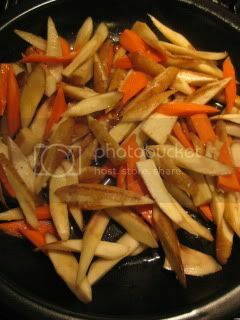 10 oz gobo (cut into oblique, soaked in water for 15 minutes and drained) and 1 medium-size carrot (peeled and cut into oblique) were first sautéed in 1T sesame oil for a few miutes. 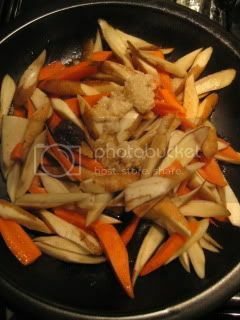 2T sake, 2T water, 2T shio-koji, and 1 tsp soba honey were added and stirred once. Covered with lid and steam-fried over medium-heat for about 25 minutes (*If the liquid gets reduced too fast, add some more water to avoid burning the skillet). Then, it was rested (the heat retention of Fukkura-san is so remarkable that the ingredients continue to cook for the next minutes) for about 10 minutes. 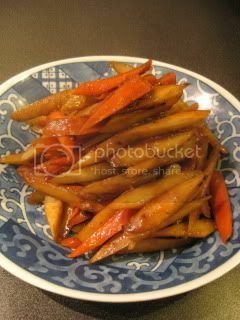 This simple dish was ready and looked so delicious. The taste was even more delicious! Wow, just a teaspoon of soba honey really characterized the flavor of this dish. It was so deep and so earthy. I loved it.